Just about any smile can benefit from some minor cosmetic enhancements. One of the easiest and most effective ways to improve the appearance of the smile is by brightening the color of the teeth. Over time, most teeth take on a dull appearance. Surface stains and discoloration tend to develop as a result of foods, beverages, certain lifestyle habits, and simple wear and tear. Teeth whitening promises to significantly brighten the teeth so that patients can enjoy a whiter smile. However, with so many teeth whitening options available, many patients aren’t sure which technique is right for them. At his dental practice, Desert Dental Alternatives, Dr. Bruno Lemay offers take-home teeth whitening. Our take-home kits offer our Palm Desert, CA, patients the effectiveness of professional teeth whitening, along with the convenience of over-the-counter products. 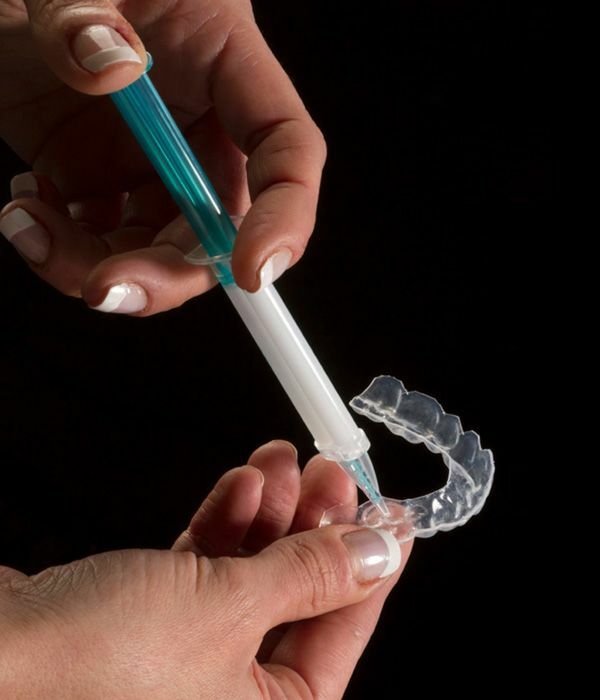 Take-home teeth whitening provides patients with professional-strength whitening gel and customized whitening trays that can be used in the comfort of their own home. Like over-the-counter products, take-home kits are used for a certain length of time each day, for an extended period of time. Dr. Lemay will provide specific use instructions based on each patient’s needs. A typical take-home whitening treatment would entail the patient wearing the trays over their teeth for about 30 minutes a day for a period of two weeks. The difference between take-home whitening treatment and over-the-counter products is that our take-home kits involve the use of highly concentrated whitening gels that are much more powerful than over-the-counter products. By the end of treatment, patients can expect the teeth to be up to eight shades whiter. These results are comparable to those that would be achieved with an in-office professional teeth whitening session, and are far greater than the average results of over-the-counter whitening gels and toothpastes. If you would like to learn more about the process of brightening your smile with take-home teeth whitening, contact us at your earliest convenience. Dr. Bruno Lemay will be happy to answer any questions you may have and let you know if you are an ideal candidate for treatment. We look forward to hearing from you!